Ann has been a journalist for 25 years. Originally from London, she graduated from Liverpool University and started work in weekly newspapers there. 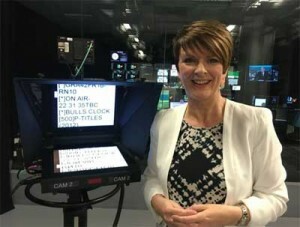 She moved into radio and joined the news desk of Radio City in 1994 and then moved on to ITV Granada in Manchester in 1998. Ann has covered the North West patch as an on the ground correspondent for many years. She was part of the reporting team that won a BAFTA for coverage of the trial following the Morecambe Bay Cockling Disaster in 2004. Currently Ann is leading the coverage of the hearings at the Hillsborough inquests. You can see Ann most Friday nights presenting Granada Reports. Desert Island Discs luxury item: My sewing machine…I might actually learn to use it! Which living person do you most admire: Vicky Travers from Liverpool. Single mother of two girls one of whom lost all her limbs to meningitis. Amazing woman. Guiltiest pleasure: Doing, and thinking about, absolutely nothing! Most memorable interview: Paul McCartney. He teased me when I defied press officer and asked about marriage to Heather Mills. Made GREAT tele!